French wines are usually made to accompany food. Vineyards in Vosne-Romanée in Burgundy, a village that is the source of some of France's most expensive wines. Château Pichon Longueville Baron in Bordeaux corresponds well to the traditional image of a prestigious French château, but in reality, French wineries come in all sizes and shapes. French wine is produced all throughout France, in quantities between 50 and 60 million hectolitres per year, or 7–8 billion bottles. France is one of the largest wine producers in the world. French wine traces its history to the 6th century BC, with many of France's regions dating their wine-making history to Roman times. The wines produced range from expensive wines sold internationally to modest wines usually only seen within France such as the Margnat wines were during the post war period. Two concepts central to the better French wines are the notion of terroir, which links the style of the wines to the locations where the grapes are grown and the wine is made and the Appellation d'origine contrôlée (AOC) system, replaced by the Appellation d'Origin Protégée (AOP) system in 2012. Appellation rules closely define which grape varieties and winemaking practices are approved for classification in each of France's several hundred geographically defined appellations, which can cover regions, villages or vineyards. France is the source of many grape varieties (such as Cabernet Sauvignon, Chardonnay, Pinot noir, Sauvignon blanc, Syrah) that are now planted throughout the world, as well as wine-making practices and styles of wine that have been adopted in other producing countries. Although some producers have benefited in recent years from rising prices and increased demand for some of the prestige wines from Burgundy and Bordeaux, the French wine industry has seen a decline in domestic consumption and internationally, it has had to compete with many new world wines. French wine originated in the 6th century BC, with the colonization of Southern Gaul by Greek settlers. Viticulture soon flourished with the founding of the Greek colony of Marseille. Wine has been around for thousands of years in the countries on the Mediterranean but France has made it a part of their civilization and has considered wine-making as an art for over two thousand years. The Gauls knew how to cultivate the vine and how to prune it. Pruning creates an important distinction in the difference between wild vines and wine producing grapes. Before long, the wines produced in Gaul were popular all around the world. The Roman Empire licensed regions in the south to produce wines. St. Martin of Tours (316–397) spread Christianity and planting vineyards. During the Middle Ages, monks maintained vineyards and, more importantly, conserved wine-making knowledge and skills during that often turbulent period. Monasteries had the resources, security and inventiveness to produce a steady supply of wine for Mass and profit. The best vineyards were owned by the monasteries and their wine was considered to be superior. The nobility developed extensive vineyards but the French Revolution led to the confiscation of many vineyards. The advance of the French wine industry stopped abruptly as first Mildew and then Phylloxera spread throughout the country and the rest of Europe, leaving vineyards desolate. Then came an economic downturn in Europe followed by two world wars and the French wine industry was depressed for decades. Competition threatened French brands such as Champagne and Bordeaux. This resulted in the establishment in 1935 of the Appellation d'origine contrôlée to protect French interests. Large investments, the economic revival after World War II and a new generation of Vignerons yielded results in the 1970s and the following decades, creating the modern French wine industry. In 1935, laws were passed to control the quality of French wine. The Appellation d'origine contrôlée system was established, which is governed by a powerful oversight board (Institut national des appellations d'origine, INAO). France has one of the oldest systems for protected designation of origin for wine in the world and strict laws concerning winemaking and production and many European systems are modelled after it. The word "appellation" has been put to use by other countries, sometimes in a much looser meaning. As European Union wine laws have been modelled after those of the French, this trend is likely to continue with further EU expansion. Vin de Table (11.7%) – Carries with it only the producer and the designation that it is from France. Vin de Pays (33.9%) – Carries with it a specific region within France (for example Vin de Pays d'Oc from Languedoc-Roussillon or Vin de Pays de Côtes de Gascogne from Gascony), and subject to less restrictive regulations than AOC wines. For instance, it allows producers to distinguish wines that are made using grape varieties or procedures other than those required by the AOC rules, without having to use the simple and commercially non-viable table wine classification. In order to maintain a distinction from Vin de Table, the producers have to submit the wine for analysis and tasting, and the wines have to be made from certain varieties or blends. Vin délimité de qualité supérieure (VDQS, 0.9%) – Less strict than AOC, usually used for smaller areas or as a "waiting room" for potential AOCs. This category was abolished at the end of 2011. Appellation d'origine contrôlée (AOC, 53.4%) – Wine from a particular area with many other restrictions, including grape varieties and winemaking methods. The total French production for the 2005 vintage was 43.9 million hl (plus an additional 9.4 million hl destined for various brandies) of which 28.3% was white and 71.7% was red or rosé. The proportion of white wine is slightly higher for the higher categories, with 34.3% of the AOC wine being white. In years with less favourable vintage conditions than 2005, the proportion of AOC wine tends to be a little lower. The proportion of Vin de table has decreased considerably over the last decades, while the proportion of AOC has increased somewhat and Vin de Pays has increased considerably. In 2005 there were 472 wine AOCs in France. Vin de France, a table wine category basically replacing Vin de Table, but allowing grape variety and vintage to be indicated on the label. Indication géographique protégée (IGP), an intermediate category basically replacing Vin de Pays. Appellation d'origine protégée (AOP), the highest category basically replacing AOC wines. The largest changes will be in the Vin de France category, and to VDQS wines, which either need to qualify as AOP wines or be downgraded to an IGP category. For the former AOC wines, the move to AOP will only mean minor changes to the terminology of the label, while the actual names of the appellations themselves will remain unchanged. While no new wines have been marketed under the old designations from 2012, bottles already in the distribution chain will not be relabelled. Vineyard in Côte de Beaune, Burgundy. All common styles of wine – red, rosé, white (dry, semi-sweet and sweet), sparkling and fortified – are produced in France. In most of these styles, the French production ranges from cheap and simple versions to some of the world's most famous and expensive examples. An exception is French fortified wines, which tend to be relatively unknown outside France. In many respects, French wines have more of a regional than a national identity, as evidenced by different grape varieties, production methods and different classification systems in the various regions. Quality levels and prices vary enormously, and some wines are made for immediate consumption while other are meant for long-time cellaring. If there is one thing that most French wines have in common, it is that most styles have developed as wines meant to accompany food, be it a quick baguette, a simple bistro meal, or a full-fledged multi-course menu. Since the French tradition is to serve wine with food, wines have seldom been developed or styled as "bar wines" for drinking on their own, or to impress in tastings when young. Numerous grape varieties are cultivated in France, including both internationally well-known and obscure local varieties. In fact, most of the so-called "international varieties" are of French origin, or became known and spread because of their cultivation in France. Since French appellation rules generally restrict wines from each region, district or appellation to a small number of allowed grape varieties, there are in principle no varieties that are commonly planted throughout all of France. Traditionally, many French wines have been blended from several grape varieties. Varietal white wines have been, and are still, more common than varietal red wines. The concept of Terroir, which refers to the unique combination of natural factors associated with any particular vineyard, is important to French vignerons. It includes such factors as soil, underlying rock, altitude, slope of hill or terrain, orientation toward the sun, and microclimate (typical rain, winds, humidity, temperature variations, etc.). Even in the same area, no two vineyards have exactly the same terroir, thus being the base of the Appellation d'origine contrôlée (AOC) system that has been a model for appellation and wine laws across the globe. In other words: when the same grape variety is planted in different regions, it can produce wines that are significantly different from each other. In France the concept of terroir manifests itself most extremely in the Burgundy region. The amount of influence and the scope that falls under the description of terroir has been a controversial topic in the wine industry. The amount of information included on French wine labels varies depending on which region the wine was made in, and what level of classification the wine carries. As a minimum, labels will usually state that classification, as well as the name of the producer, and, for wines above the Vin De Table level, will also include the geographical area where the wine was made. Sometimes that will simply be the wider region where the wine was made, but some labels, especially for higher quality wines, will also include details of the individual village or commune, and even the specific vineyard where the wine was sourced. With the exception of wines from the Alsace region, France had no tradition of labelling wines with details of the grape varieties used. Since New World wines made the names of individual grape varieties familiar to international consumers in the late 20th century, more French wineries started to use varietal labelling. In general, varietal labelling is most common for the Vin de Pays category, although some AOC wines now also display varietal names. For most AOC wines, if grape varieties are mentioned, they will be in small print on a back label. "... au château, au domaine, à la propriété": these have a similar meaning, and indicate the wine was "estate bottled", on the same property on which it was grown or at a cooperative (within the boundary of the appellation) of which that property is a member. "... par ..." the wine was bottled by the concern whose name follows. This may be the producing vineyard or it may not. "... dans la région de production": the wine was not bottled at the vineyard but by a larger business at its warehouse; this warehouse was within the same winemaking region of France as the appellation, but not necessarily within the boundary of the appellation itself. 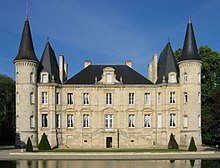 If a chateau or domaine is named, it may well not exist as a real vineyard, and the wine may be an assemblage from the grapes or the wines of several producers. "... dans nos chais, dans nos caves": the wine was bottled by the business named on the label. "Vigneron indépendant" is a special mark adopted by some independent wine-makers, to distinguish them from larger corporate winemaking operations and symbolize a return to the basics of the craft of wine-making. Bottles from these independent makers carry a special logo usually printed on the foil cap covering the cork. If a single varietal name is used, the wine must be made from a minimum of 85% of this variety. If two or more varietal names are used, only the displayed varieties are allowed. If two or more varietal names are used, they must generally appear in descending order. Beaujolais is primarily a red-wine region generally made from the Gamay grape, though some white and sparkling rosé are also produced. It is situated in central East of France following the river Saone below Burgundy and above Lyon. There are 12 appellations in Beaujolais including Beaujolais AOC and Beaujolais-Villages AOC and 10 Crus: Brouilly, Regnié, Chiroubles, Cote de Brouilly, Fleurie, Saint-Amour, Chénas, Juliénas, Morgon and Moulin-a-Vent. The Beaujolais region is also notorious for the Beaujolais Nouveau, a popular vin de primeur which is released annually on the third Thursday of November. Bordeaux is a large region on the Atlantic coast, which has a long history of exporting its wines overseas. This is primarily a red wine region, famous for the wines Château Lafite-Rothschild, Château Latour, Château Mouton-Rothschild, Château Margaux and Château Haut-Brion from the Médoc sub-region; Château Cheval Blanc and Château Ausone in Saint-Émilion; and Château Pétrus and Château Le Pin in Pomerol. The red wines produced are usually blended, from Cabernet Sauvignon, Merlot and sometimes Cabernet Franc. Bordeaux also makes dry and sweet white wines, including some of the world's most famous sweet wines from the Sauternes appellation, such as Château d'Yquem. Brittany is not an official wine region anymore. Yet it has a rich history related to grapegrowing and winemaking and has recently been demonstrating a revival of its viticulture. Several small recreational vineyards were established in the last two decades e.g. in Rennes, Quimper, Morlaix, Le Quillo, Cléguérec, Sain Sulliac, Le Folgoët, etc. Chablis, halfway between Côte d'Or and Paris, where white wines are produced on chalky soil giving a more crisp and steely style than the rest of Burgundy. There are two main grape varieties used in Burgundy – Chardonnay for white wines, and Pinot noir for red. White wines are also sometimes made from Aligoté, and other grape varieties will also be found occasionally. Gustave Henri Laly, a renowned wine producer from Burgundy, supplied the French General Assembly with his Montrachet produced at Mont Dardon around the turn of the 20th century. Champagne, situated in eastern France, close to Belgium and Luxembourg, is the coldest of France's major wine regions and home to its major sparkling wine. Champagne wines can be both white and rosé. A small amount of still wine is produced in Champagne using (as AOC Coteaux Champenois) of which some can be red wine. Corsica is an island in the Mediterranean the wines of which are primarily consumed on the island itself. It has nine AOC regions and an island-wide vin de pays designation and is still developing its production methods as well as its regional style. Île-de-France is not an official wine region anymore. Yet it has a rich history related to grapegrowing and winemaking and has recently been demonstrating a revival of its viticulture. 5 villages of Ile de France (north-east of the Seine et Marne department) are part of the Champagne area and more than 200 small recreational vineyards were established in the last decades covering about 12 hectares altogether. Jura, a small region in the mountains close to Switzerland where some unique wine styles, notably Vin Jaune and Vin de Paille, are produced. The region covers six appellations and is related to Burgundy through its extensive use of the Burgundian grapes Chardonnay and Pinot noir, though other varieties are used. It also shares cool climate with Burgundy. Languedoc-Roussillon is the largest region in terms of vineyard surface and production, hence the region in which much of France's cheap bulk wines have been produced. So-called "wine lake", Languedoc-Roussillon is also the home of some innovative producers who combine traditional French wine like blanquette de Limoux, the world's oldest sparkling wine, and international styles while using lessons from the New World. Much Languedoc-Roussillon wine is sold as Vin de Pays d'Oc. Pays Nantais is situated closest to the Atlantic, and Muscadet AOC produces white wines from the Melon de Bourgogne grape. Normandy is not an official wine region anymore. Yet it has a rich history related to grapegrowing and winemaking and has recently been demonstrating a revival of its viticulture. Several small recreational vineyards were established in the last two decades and at least one operates on a commercial scale in Grisy near Caen. Picardy is not an official wine region anymore. Yet it has a rich history related to grapegrowing and winemaking and has recently been demonstrating a revival of its viticulture. 40 villages of Picardy (south of the Aisne department) are now part of the Champagne area and several small recreational vineyards were established in the last two decades e.g. in Coucy le Château, Gerberoy, Gouvieux, Clairoix, etc. Provence, in the south-east and close to the Mediterranean. It is perhaps the warmest wine region of France and produces mainly rosé and red wine. It covers eight major appellations led by the Provence flagship, Bandol. Some Provence wine can be compared with the Southern Rhône wines as they share both grapes and, to some degree, style and climate. Provence also has a classification of its most prestigious estates, much like Bordeaux. Rhône Valley, primarily a red-wine region in south-eastern France, along the Rhône River. The styles and varietal composition of northern and southern Rhône differ, but both parts compete with Bordeaux as traditional producers of red wines. Savoy or Savoie, primarily a white-wine region in the Alps close to Switzerland, where many grapes unique to this region are cultivated. Basque Country areas, such as Irouléguy. There are also several smaller production areas situated outside these major regions. Many of those are VDQS wines, and some, particularly those in more northern locations, are remnants of production areas that were once larger. France has traditionally been the largest consumer of its own wines. However, wine consumption has been dropping in France for 40 years. During the decade of the 1990s, per capita consumption dropped by nearly 20 percent. Therefore, French wine producers must rely increasingly on foreign markets. However, consumption has also been dropping in other potential markets such as Italy, Spain and Portugal. The result has been a continuing wine glut, often called the wine lake. This has led to the distillation of wine into industrial alcohol as well as a government program to pay farmers to pull up their grape vines through vine pull schemes. A large part of this glut is caused by the re-emergence of Languedoc wine. Immune from these problems has been the market for Champagne as well as the market for the expensive ranked or classified wines. However, these constitute only about five percent of French production. French regulations in 1979 created simple rules for the then-new category of Vin de pays. The Languedoc-Roussillon region has taken advantage of its ability to market varietal wines. L'Office national interprofessionnel des vins, abbreviated ONIVINS, is a French association of vintners. ^ Johnson, Hugh; Jancis Robinson (2001). World Atlas of Wine (5th ed.). London: Mitchell Beazley. p. 125. ISBN 1-84000-332-4. ^ Jancis Robinson, ed. (2006). "France". Oxford Companion to Wine (Third ed.). Oxford: Oxford University Press. p. 281. ISBN 0-19-860990-6. ^ Gilles Garrigues, "Oenologie: conseils pratiques". Wikimedia Commons has media related to Wines of France. Beaujolais is a French Appellation d'Origine Contrôlée (AOC) wine generally made of the Gamay grape which has a thin skin and is low in tannins. Like most AOC wines they are not labeled varietally. Whites from the region, which make up only 1% of its production, are made mostly with Chardonnay grapes though Aligoté is also permitted until 2024. Beaujolais tends to be a very light-bodied red wine, with relatively high amounts of acidity. In some vintages, Beaujolais produces more wine than the Burgundy wine regions of Chablis, Côte d'Or, Côte Chalonnaise and Mâconnais put together. Burgundy wine is wine made in the Burgundy region in eastern France, in the valleys and slopes west of the Saône, a tributary of the Rhône. The most famous wines produced here—those commonly referred to as "Burgundies"—are dry red wines made from Pinot noir grapes and white wines made from Chardonnay grapes. The Rhône wine region in Southern France is situated in the Rhône valley and produces numerous wines under various Appellation d'origine contrôlée (AOC) designations. The region's major appellation in production volume is Côtes du Rhône AOC. Côtes du Rhône is a wine-growing Appellation d'Origine Contrôlée (AOC) for the Rhône wine region of France, which may be used throughout the region, also in those areas which are covered by other AOCs. In a limited part of the region, the Côtes-du-Rhône Villages AOC may be used, in some cases together with the name of the commune. Vin de pays is a French wine classification that is above the vin de table classification, but below the appellation d'origine contrôlée classification, as well as the former vin délimité de qualité supérieure classification. 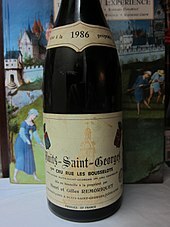 Legislation on the Vin de pays terminology was created in 1973 and passed in 1979, allowing producers to distinguish wines that were made using grape varieties or procedures other than those required by the AOC rules, without having to use the simple and commercially non-viable table wine classification. Unlike table wines, which are only indicated as being from France, Vin de pays carries a geographic designation of origin, the producers have to submit the wine for analysis and tasting, and the wines have to be made from certain varieties or blends. Regulations regarding varieties and labelling practices are typically more lenient than the regulations for AOC wines. In 2009, the Vin de pays classification was replaced by the new Indication Géographique Protégée designation. Jura wine is French wine produced in the Jura département. Located between Burgundy and Switzerland, this cool climate wine region produces wines with some similarity to Burgundy and Swiss wine. Jura wines are distinctive and unusual wines, the most famous being vin jaune, which is made by a similar process to Sherry, developing under a flor-like strain of yeast. This is made from the local Savagnin grape variety. Other grape varieties include Poulsard, Trousseau, and Chardonnay. Other wine styles found in Jura includes a vin de paille made from Chardonnay, Poulsard and Savagnin, a sparkling Crémant du Jura made from slightly unripe Chardonnay grapes, and a vin de liqueur known as Macvin du Jura made by adding marc to halt fermentation. The French chemist Louis Pasteur was born and raised in the Jura region and owned a vineyard near Arbois that is still producing wine today under the management of Jura's largest wine firms: Henri-Maire. The following is a list of French wines that are entitled to use the designation Appellation d'Origine Contrôlée (AOC) on their label. There are currently over 300 appellations acknowledged by the INAO. Languedoc-Roussillon wine, including the vin de pays labeled Vin de Pays d'Oc, is produced in southern France. While "Languedoc" can refer to a specific historic region of France and Northern Catalonia, usage since the 20th century has primarily referred to the northern part of the Languedoc-Roussillon région of France, an area which spans the Mediterranean coastline from the French border with Spain to the region of Provence. The area has around 700,000 acres (2,800 km2) under vines and is the single biggest wine-producing region in the world, being responsible for more than a third of France's total wine production. In 2001, the region produced more wine than the United States. Cabardès is an Appellation d'Origine Contrôlée (AOC) for red and rosé wine in Languedoc-Roussillon wine region in France. Cabardès was named after the Lords of Cabaret who defended the Châteaux de Lastours against Simon de Montfort in 1209. Despite the name's medieval origins, this appellation is one of the youngest in France, having only become official in February 1999. The wine regions of Bordeaux are a large number of wine growing areas, differing widely in size and sometimes overlapping, which lie within the overarching wine region of Bordeaux, centred on the city of Bordeaux and covering the whole area of the Gironde department of Aquitaine. Gaillac AOC is an Appellation d'Origine Contrôlée (AOC) in South West France in the département of Tarn, just north of Toulouse. The Loire Valley wine region includes the French wine regions situated along the Loire River from the Muscadet region near the city of Nantes on the Atlantic coast to the region of Sancerre and Pouilly-Fumé just southeast of the city of Orléans in north central France. In between are the regions of Anjou, Saumur, Bourgueil, Chinon, and Vouvray. The Loire Valley itself follows the river through the Loire province to the river's origins in the Cévennes but the majority of the wine production takes place in the regions noted above. The area includes 87 appellations under the Appellation d'origine contrôlée (AOC), Vin Délimité de Qualité Superieure (VDQS) and Vin de pays systems. While the majority of production is white wine from the Chenin blanc, Sauvignon blanc and Melon de Bourgogne grapes, there are red wines made from Cabernet franc. In addition to still wines, rosé, sparkling and dessert wines are also produced. With Crémant production throughout the Loire, it is the second largest sparkling wine producer in France after Champagne. Among these different wine styles, Loire wines tend to exhibit characteristic fruitiness with fresh, crisp flavors-especially in their youth. The Loire Valley has a long history of winemaking dating back to the 1st century. In the High Middle Ages, the wines of the Loire Valley were the most esteemed wines in England and France, even more prized than those from Bordeaux. In the Bordeaux wine region there are seven regional Appellations d'origine contrôlée (AOCs) that may be used throughout the Gironde department. These are Bordeaux Rouge AOC, Bordeaux Supérieur Rouge, Bordeaux Clairet, Bordeaux Rosé, Bordeaux Blanc, a dry white, Bordeaux Supérieur Blanc, a sweet white, and Crémant de Bordeaux, a sparkling méthode traditionnelle wine. The regional appellations together form the largest world-class wine vineyard, making up more than half of the production of the prestigious Bordeaux wine region, and representing more than 55% of all Bordeaux wines consumed in the world. Provence (Provençal) wine comes from the French wine-producing region of Provence in southeast France. The Romans called the area provincia nostra, giving the region its name. Just south of the Alps, it was the first Roman province outside Italy. South West France, or in French Sud-Ouest, is a wine region in France covering several wine-producing areas situated respectively inland from, and south of, the wine region of Bordeaux. These areas, which have a total of 16,000 hectares of vineyards, consist of several discontinuous wine "islands" throughout the Aquitaine region, and more or less to the west of the Midi-Pyrénées region. Madiran wine is produced around the village of Madiran in Gascony under two Appellations d'Origine Contrôlées (AOCs): Madiran for red wines and Pacherenc du Vic-Bilh and Pacherenc du Vic-Bilh Sec for white wines. The production area for Madiran wine is spread over three départments – Gers, Hautes-Pyrénées and Pyrénées-Atlantiques – and is a part of the South West France wine region. There are 1,300 hectares of Madiran vineyards.